(NOTE: These are last year's awards. As soon as we get pictures of the 2019 Exhibit Awards, they will be listed on this page). These awards were especially made for the 2018 Greater Houston Stamp Show and the Single Frame competition by Houston Studio Glass, Inc.
Kathy Poeppel and Richard Moiel are proprietors of Houston Studio Glass and have prepared glass art awards in the past for the GHSS. 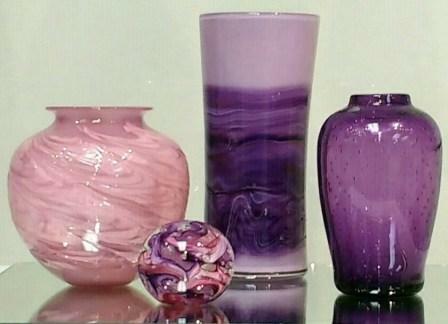 Large blended vase in shades of dark purple. 3-inch diameter purple cat's eye glass paper weight.